As a former Public Defender for Chester County and Captain in the Marine Corps, Bill’s proclivity for trying complex litigation cases comes as no surprise. William J. Gallagher has been practicing law and serving the community for over 50 years. His practice focuses on general litigation, personal injury and professional malpractice cases, trusts and estates and family law matters. 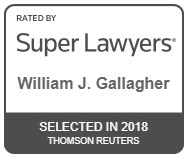 Mr. Gallagher currently serves on the Board of Directors of Legal Aid of Southeastern Pennsylvania and is a past president of the organization. He is also a member of the Chester County Bar Association’s Pro Bono Committee and Pennsylvania Bar Association’s Legal Services to the Public Committee. Additionally, Mr. Gallagher served as Board Chair for the Chester County Community Foundation from 2014 to 2016. A longtime resident of Kennett Square, Mr. Gallagher has also served as zoning hearing board solicitor for the Kennett Township since 1970. A graduate of La Salle University, Mr. Gallagher received his law degree from Villanova University.